Councils around Queensland are again tightening their animal regulations. This means a well built cat cage may be a good idea if your cat is the wandering kind! From December 2010 cats have had to be registered with the local council to cut down on stray and feral cats and to reduce the burden on local pet shelters. There has also been additional pressure on cat owners to keep their cats from wandering. Keeping your cat contained in your yard has always been difficult, due to a cat’s ability to jump and climb. Adding to the difficulty is the fact that cats will often wander at night. Keeping them inside 24/7 is hardly an option, so what’s a responsible cat owner to do? If you live in and around Brisbane your problems are solved. 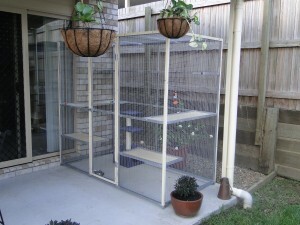 Clive has already built many cat cages in Brisbane, both for catteries and private individuals. Cages for cats give your pets the choice to be outside whenever they want and are fitted with shelves at random heights to give them the ability to climb and jump, or merely bask in the sun. They are easily cleaned by hosing out when necessary. The picture on this page show a typical cat enclosure now being enjoyed by two rather stressed feline immigrants from earthquake prone Christchurch NZ. Apparently they have become slightly more relaxed since being allowed outside! Cat cages may also be fitted with extra runs to make the area larger. This may be of interest to working people who have to leave their animals for extended periods of time. The cage may also be built to your own measurements and the shelf placing can be altered too. Shelves are generally made from plywood, but many cat owners line the shelves with carpet for extra comfort in the cold weather. I need help to find a free cat in closer for my cat I live in a hostel and he is always getting hurt by other cats and I thing from possums too please can you help me. Hi ,could you please tell me how much for a cage like the one in the picture. What are your cat enclosure prices? Hi How much is the cat enclosure pictured.